I love to change things up each month and keep things fresh! One way we do that is by decorating for each holiday, its something Kaitlyn loves to do and looks forward to. She loves holidays and parties as much as her mama does. I made this cute centerpiece to serve two purposes...to be super cute for Valentines day and to help reinforce positive behavior at the dinner table...how do you ask???? We have struggled with getting our oldest (3 1/2) to use good manners consistently at the table since her brother arrived on the scene some of her manners have regressed....which I don't need! Especially when I already have an infant to clean up after. 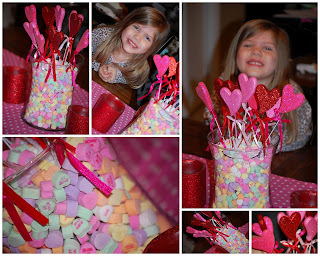 So I found a way to kill two birds with one stone :) Each day Kaitlyn has a chance to earn 3 candy hearts ( one for each objective) each time she eats, she has to show good manners, eat all her food, stay seated and clear her dishes and her brothers when we are all done. If she follows all of those expectations then she receives all four....and since the jar is filled to the rim with fun super cute candy it is a constant reminder for her to make good choices. To make your own candy jar just get a large glass vase and set a glass cup inside ( this will keep the amount of candy needed to a minimum and give you a place to put fresh flowers, decorations etc in the center of the vase. 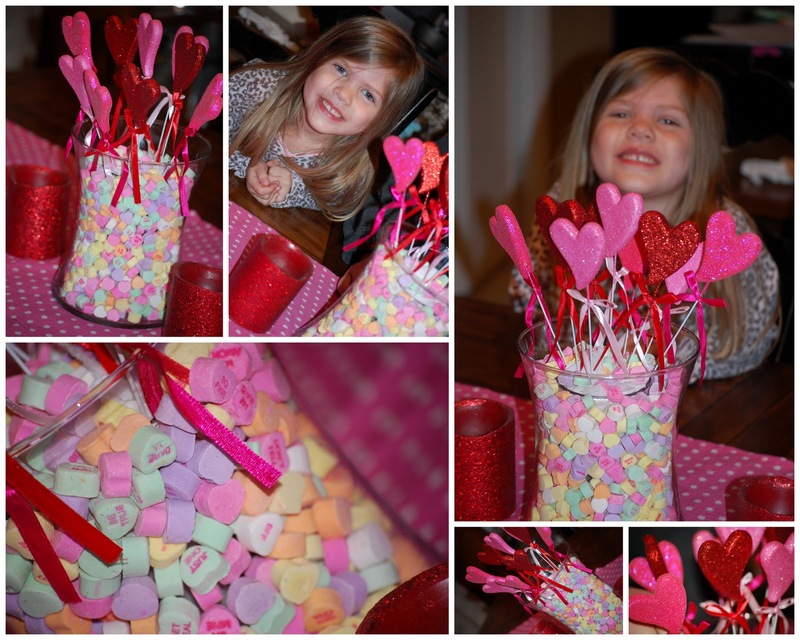 Then fill the large vase with your favorite holiday candy ( candy hearts, jelly beans, sweet tarts, peeps.....get as creative as you would like!) and Viola! you have a great motivating centerpiece that is sure to please!